After an intense fire season swept over the Pacific Northwest last summer, a team of University of Idaho students got the chance to market and promote a computer simulation that helps people understand how to protect themselves and their homes from wildfires. Harsh Patel, 21, came to UI from Eagle, Idaho. He is currently the group leader for marketing the simulation, Secure the Shelter, which was designed by UI faculty. The group received a $5,000 grant and works through Vandal Solutions, a student-run business that allows College of Business and Economics students to gain real-world experience by using the skills they’ve learned in class. 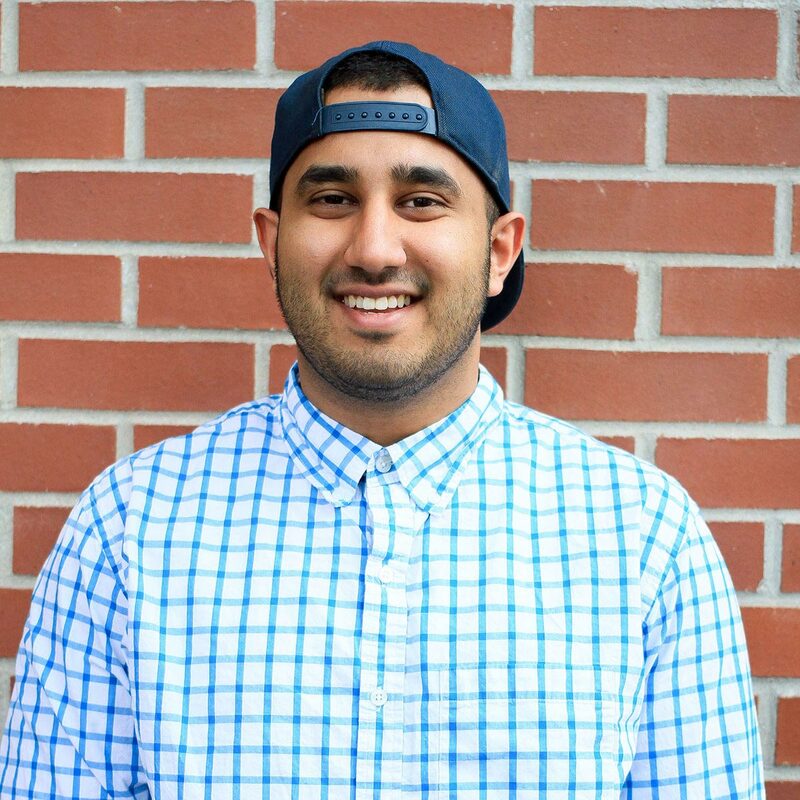 Patel, a senior finance major, said his group practices marketing the product to different crowds. Wildfires destroyed nearly 7.1 million acres of land in the western United States by mid-August in 2015. It was the earliest so many acres had burned in the United States in over 20 years, the National Interagency Coordination Center reported. This large fire season created a great opportunity to inform the public about what to do to protect homes and people from fires, Patel says. “North Idaho was the perfect place to start a simulation like this,” he says. The simulation uses Samsung Oculus Rift glasses, which cover users’ eyes and transport them into a virtual world. Inside Secure the Shelter, viewers are given different tasks. The simulation is broken down into four phases: fireproof the house, pack a grab bag, remove hazardous materials in the area and, finally, wait as the wildfire approaches. If the previous tasks were performed perfectly, the house will survive the fire. UI finance student Harsh Patel. Because Patel and his team have used the 3-D goggles so many times, getting the simulation done now is like clockwork. It isn’t as easy for newbies, though. “Seeing people use it from the outside is really funny,” he says. Less humorous are the challenges the team has faced along the way. Earlier this spring, Patel and his team went to the North 40 store in Lewiston to promote Secure the Shelter. While there, they realized people thought they were trying to sell a product instead of promoting something that is actually going to be free. The biggest issue they have encountered is the generation gap. The simulation is easier for younger generations to use because they are more accustomed to using an Xbox controller, which controls the avatar inside the simulation. Patel explains that it’s a struggle for older people to use and connect with the simulation. Feedback plays a large role in what Patel’s group does. Patel has learned that while younger users are interested in using the Oculus Rift glasses, they don’t care about fire safety as much. Some older users struggle with using the 3-D technology, but they are interested in learning more about wildfire safety. “We need to be able to find the balance when marketing,” he said. Being the Secure the Shelter team leader comes with a lot of responsibility. One night, Patel received a phone call from an accounting professor, asking for a website to be created by the next morning. He stayed up late designing one from the ground up. 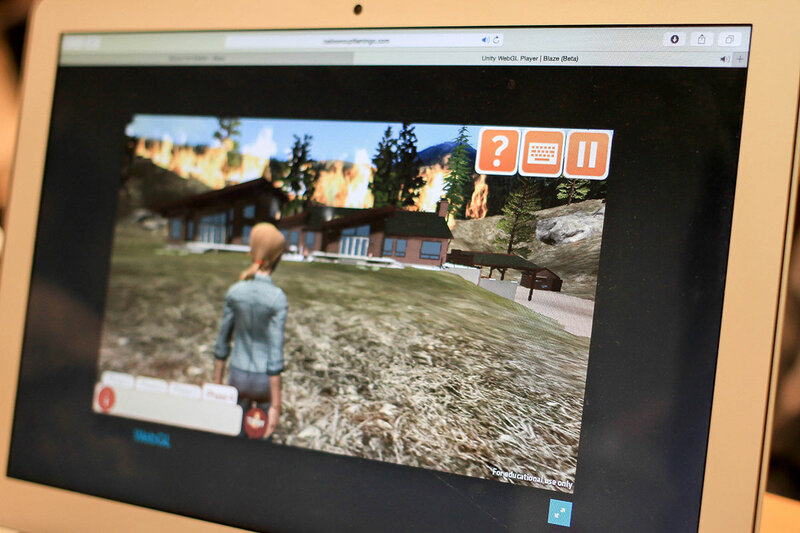 A screenshot of the Secure the Shelter fire simulation program. Writer: Emily Lowe, from Kuna, is a sophomore majoring in journalism. She hopes to write for a travel or outdoor magazine in the future. Photographer: Irish Joy Martos is a senior international student from the Philippines and is majoring in psychology. She enjoys photography as a hobby and works at the student newspaper, The Argonaut.